SARASOTA, Fla., September 14, 2018 – On Thursday, Sept. 13, 2018, Dealers United was awarded the Fourth Annual Ringling College Innovation by Creative Design Award, a collaboration of the Economic Development Corp. of Sarasota County and the Ringling College of Art and Design. 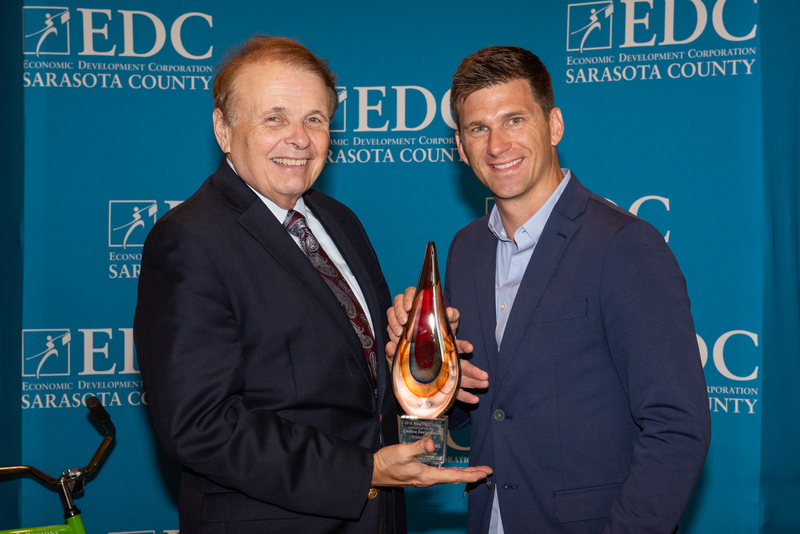 The award recognizes Dealers United’s use of creative innovation to develop a product over the past five years, address a market need that has since demonstrated financial success, and generate a majority of its revenues from outside Sarasota County. The product nominated, “Facebook Inventory + VIN Lead Ads,” helps automotive dealerships easily transform their vehicle inventory into ads that are delivered across Facebook and Instagram. Using third and first-party data, complex machine learning, and dynamic ad formats, the program helps auto dealers connect the right car, to the right consumer, at the right time. Riding the trend of using social ads to reach more consumers, Facebook Inventory + VIN Lead Ads have quickly become accepted as one of the most powerful ways a dealership can generate vehicle interest and leads. Since its inception in 2017, the program has grown beyond direct-to-dealer business and is now launching as a white-labeled solution available through other agencies and automotive industry ventures. Today, Dealers United holds the greatest number of automotive success stories published by Facebook Business, has been deemed a Top-Tier Facebook Partner and Top 10 Facebook Automotive Agency, and is 1 of 9 Oracle Elite Data Marketing Partners. For more information on Dealers United’s Facebook Inventory + VIN Lead Ads solution, visit www.dealersunited.com/inventoryads. About Dealers United: Dealers United is a game-changing automotive company dedicated to helping auto dealers improve their dealerships through digital, 1st party advertising solutions. Dealers United has direct partnerships with the largest players in Digital Advertising including Facebook, Oracle, Craigslist, and Google and has helped over 6,500 dealers nationwide cut costs, save time, and sell more cars. Sign up for free at www.dealersunited.com.